What is Ozone and Ozonated Water? Ozone is an active state of oxygen composed of three oxygen atoms. A person can boost their body's oxygen metabolism and increase natural energy levels by drinking water that has been infused with ozone gas, otherwise known as ozonated water. The daily consumption of ozonated water has been proven to increase oxygen in the body, which has a positive impact on human health. Ozonated water is even being used as a supplemental cancer treatment because of its ability to kill microbes in the bloodstream which boosts the body's immune system. An optimum oxygen level is also essential to human health because it is needed to maintain the body's elimination process. With optimum levels of oxygen present, the body is able to make better use of the nutrients it receives from food and supplements. What are Ozone Generators and Ozone Systems? 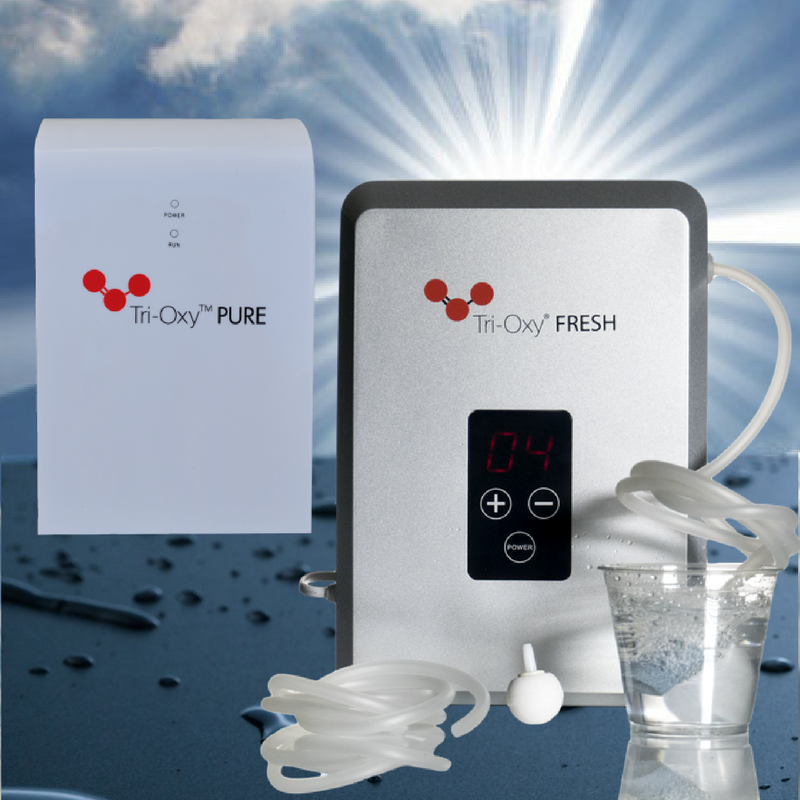 Ozone generators, such as the Tri-Oxy® FRESH water ozonator and Tri-Oxy® PURE ozone system are innovative machines that enable you to produce ozonated water at home. These small and medium-sized ozone generators ozonate water for drinking, washing surfaces and cleaning fresh foods. Ozonated water is great for hand washing too. Ozone quickly kills bacteria and viruses with its natural sanitizing effect, but without leaving any toxic residue behind. Larger whole-home ozone systems, such as one of the Tri-Oxy® PURE Ozone Systems, allow for on-demand ozone (via the home's water line) and produce enough ozonated water for use in the shower, laundry room, or even the garden!